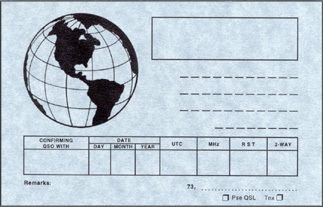 The amateur globe QSL cards are printed on heavy, blue-grey colored parchment stock. There are 100 cards per package. Provisions for all pertinent information is provided on the front of the card. Card size is 5.5 x 3.5 inches (14 x 8.9 cm). Copyright 2002-2016 Universal Radio, Inc.